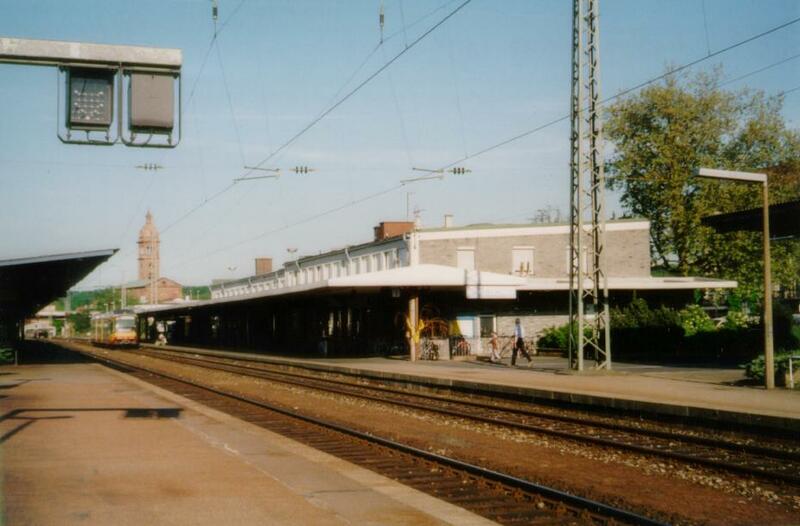 The station building of Pforzheim Hbf, seen from the southwest. 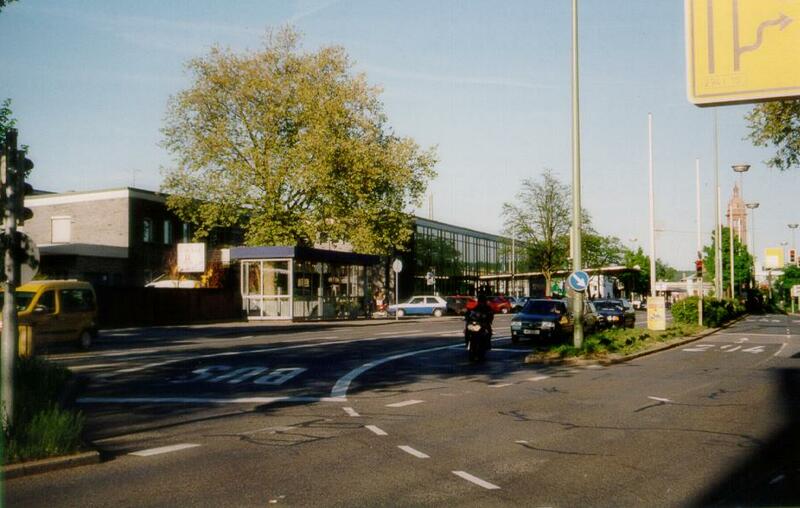 Das Empfangsgebäude von Pforzheim Hbf von Südwesten, aus Richtung Bahnhofstraße gesehen. The station building of Pforzheim Hbf from the track side, seen from the northwest. Das Empfangsgebäude von Pforzheim Hbf von der Gleisseite aus Richtung Nordwesten gesehen. 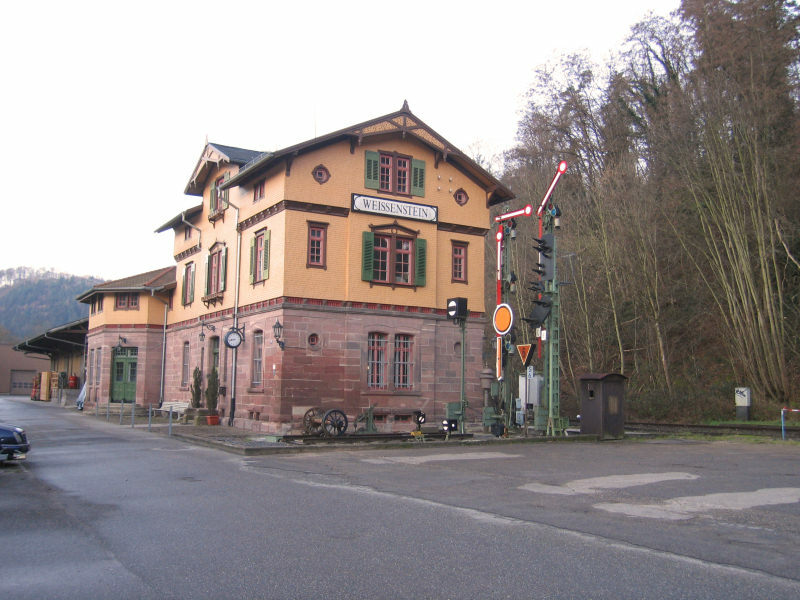 The old railway station in Pforzheim-Weissenstein is now used by the local railway friends. A new stop for the Pforzheim-Eutingen trains is to be built close to this location. Station interior of Pforzheim Central Station. The reception building was opened in June 1958. 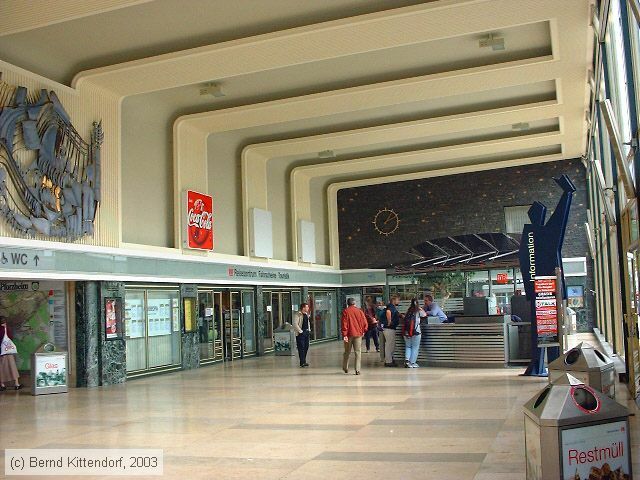 The architect was Helmuth Conradi (1903-1973), who had already designed the station building of Heidelberg Central Station opened in 1955. The street side to the left is completely glazed. Photo taken Tuesday 2 June 2015. 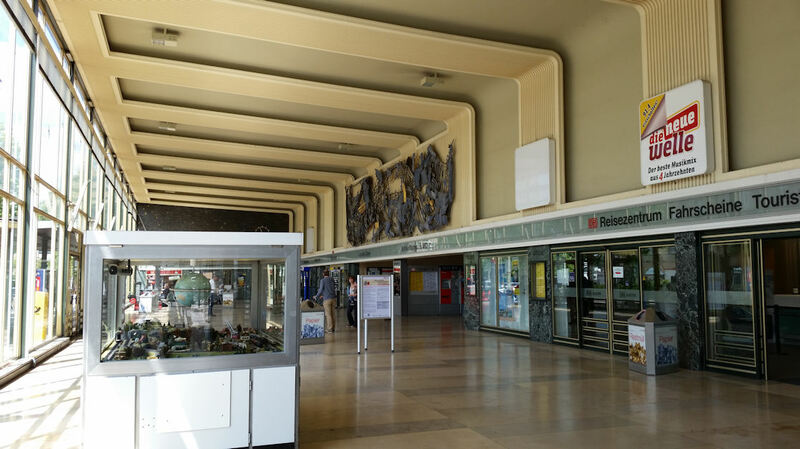 Streetside view of Pforzheim Central Station opened in 1958. The street side is completely glazed. 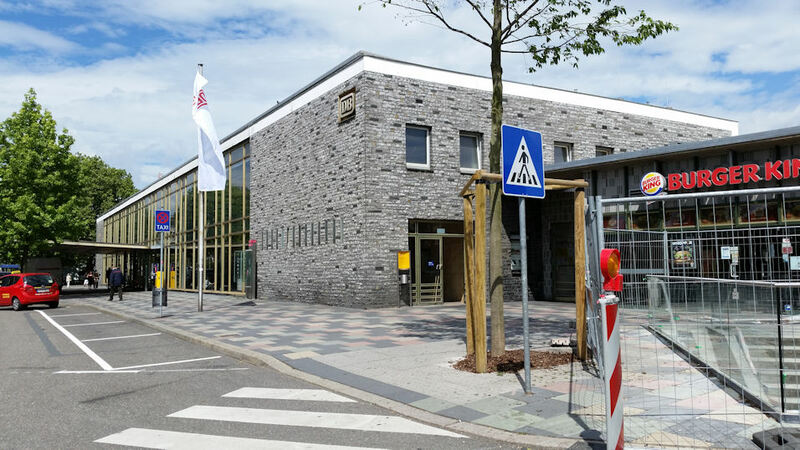 A very thin canopy marks the main entrance; its panelling with gold anodized aluminum plates refers to the importance of the clock and jewelery industry of Pforzheim. The fences on the right protect the site of the new bus station. Photo taken Tuesday 2 June 2015. Left roof of the new bus station in Pforzheim still under construction. 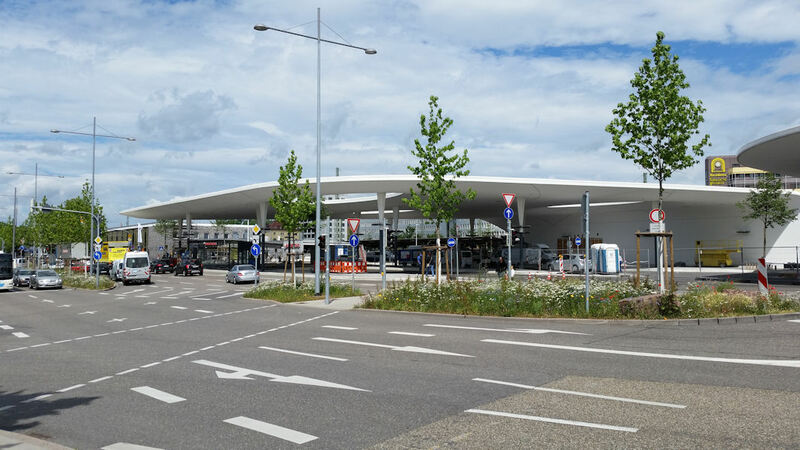 The new central bus station covers the entire space between the reception building of the central station and the northern city bridge, the platform 1 and the Stadtbau building, intersected by the Luisenstraße and Lindenstraße streets. Photo taken Tuesday 2 June 2015. 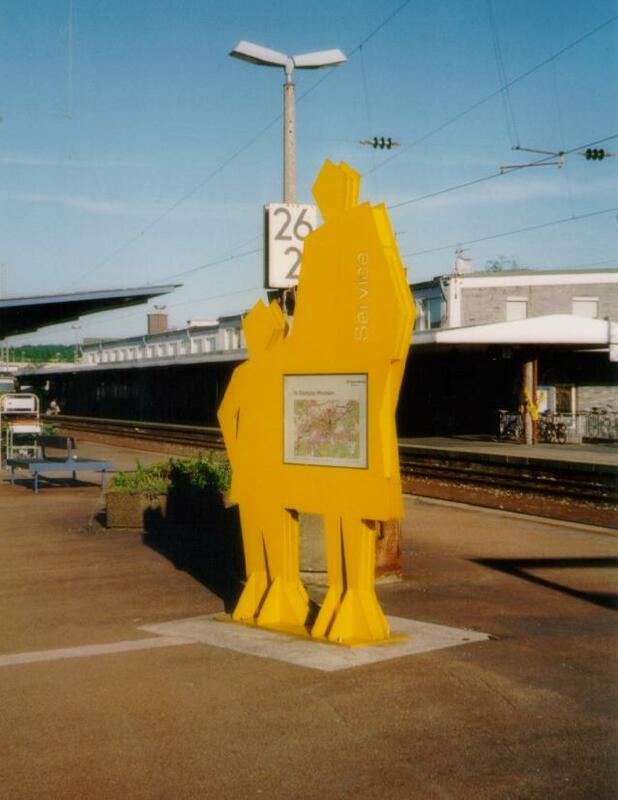 Some time ago, Deutsche Bahn has equipped its larger stations with "tin giants" like these, which are meant to offer various kinds of information in an eye-catching way. This yellow version here contains a town map. Seit einiger Zeit hat die Deutsche Bahn ihre größeren Bahnhöfe mit solchen "Blechriesen" verziert, die von weitem sichtbar verschiedene Informationen bereitstellen sollen. Diese gelbe Ausführung hier enthält einen Stadtplan. Innenansicht der Bahnhofshalle am 03. Oktober 2003.